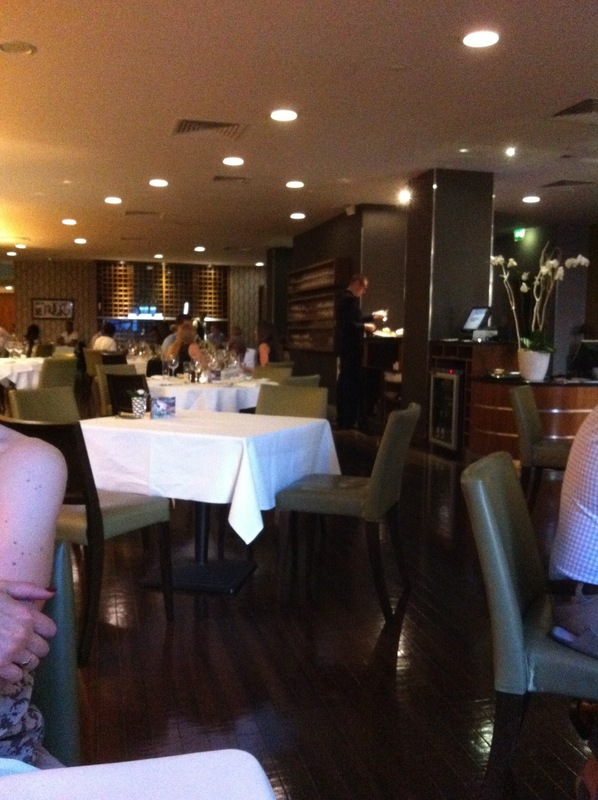 Opus restaurant is one of my personal favourite restaurants in Birmingham. It’s independent, classy, contemporary and market fresh, using the freshest produce available. It’s been open for eight years on Cornwall Street in the heart of the Colmore Business District, a thriving area in Birmingham city centre and home of some of Birmingham’s best cafe’s and restaurants. 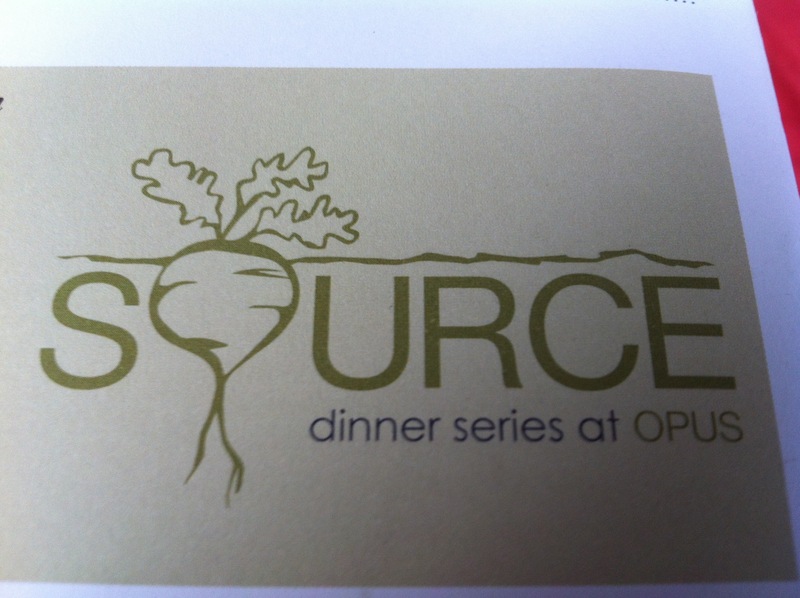 Opus Restaurant celebrates the freshest ingredients, British, mostly locally sourced, knowing their farmers, producers and history of their fruit and veg. It is one of the best restaurants for vegetarians and vegans as you can always guarantee a lovely seasonal meal. It daily changes its menu, called market menu which allows what produce is best and now. Allowing all of the ingredients to shine through. 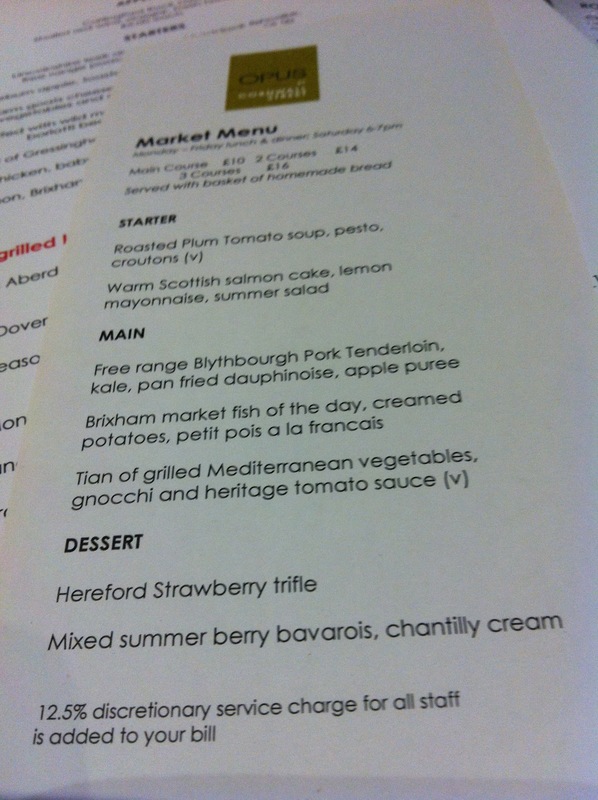 The Market Menu is great value a main course is £10 two courses are £14 and three £16 and includes home made bread. Which was excellent. That is why Ruth and I visited on a Friday evening to sample the here and now. Ruth loves lobster, sold by Opus for a short period of time when it’s in season and at it’s freshest. It’s a regular yearly treat and visit at this time of year for us. For me the luxury is to try such great summer produce by sampling their market menu. The Market Menu offers one veggie option for a starter and main, which though limited in choice is outstandingly good value. It’s probably the best value meal in the city for the quality in both food, service and the classy Opus environment. We began in the bar which is a really nice way to start a meal at opus as it sets the tone and it feels right and proper. As an aside, two years ago we watched Mo Farah win his second gold medal at the London Olympics, in the bar, on our i phone:) it’s that kind of place:). 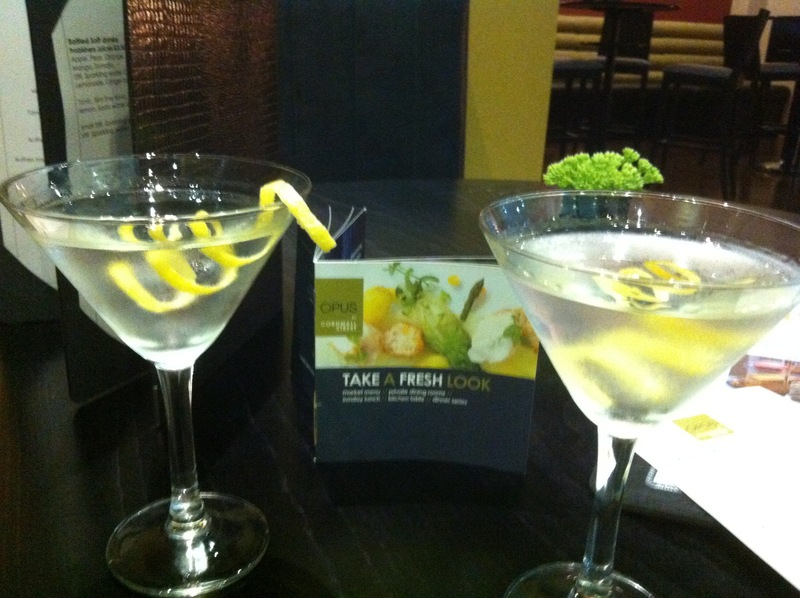 We ordered two Martinis, one dry and one wet, both excellent, both well made with local Chase Gin. The restaurant area is spacious and caters for couples, small groups and large groups well. You never feel crammed in, and the room feels airy and classy. I chose my dinner from the market menu. For my starter I can only describe it as one of the best tomato soups I have ever had. A total luxury of flavour. 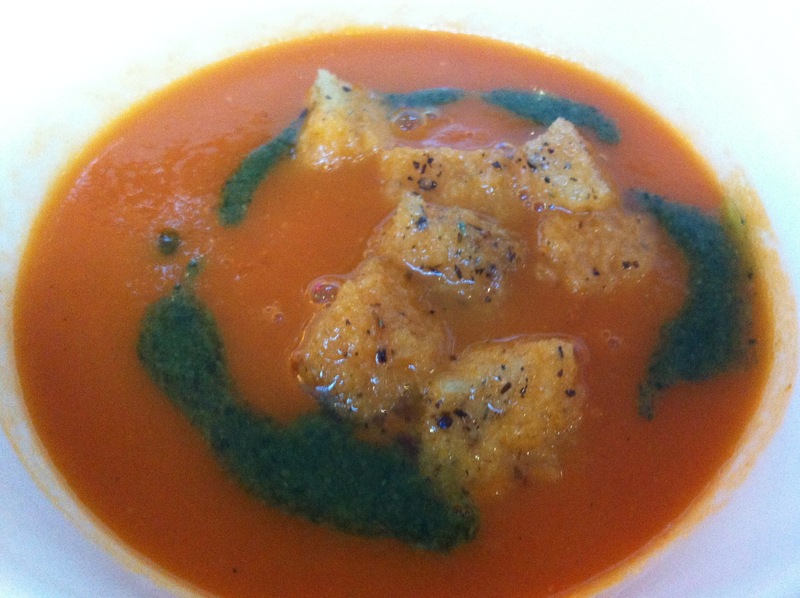 I had the Roasted Plum tomato soup, pesto, croutons. The flavour of the tomatoes were so fresh and rich, an indulgent starter, demonstrating what Opus do well. Fresh bang on in season ingredients. It was superb, with a delicate pesto drizzle on the top and crunchy croutons sitting inside. Lovely presentation. 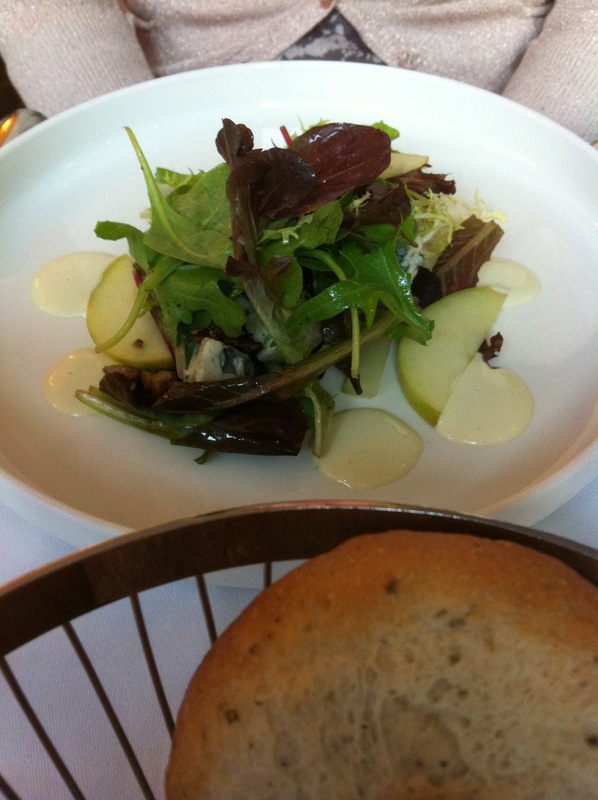 Ruth ate from the A La Carte for her starter and enjoyed the fresh bite of her celery, Braeburn apple, toasted walnut salad with Roquefort dressing. 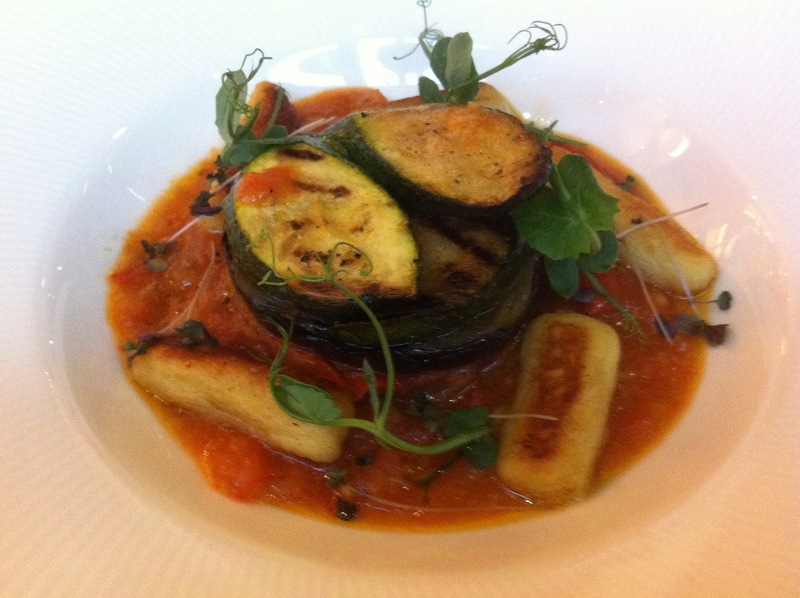 For my main course I had the Tian of grilled Mediterranean vegetables, gnocchi, and heritage tomato sauce. 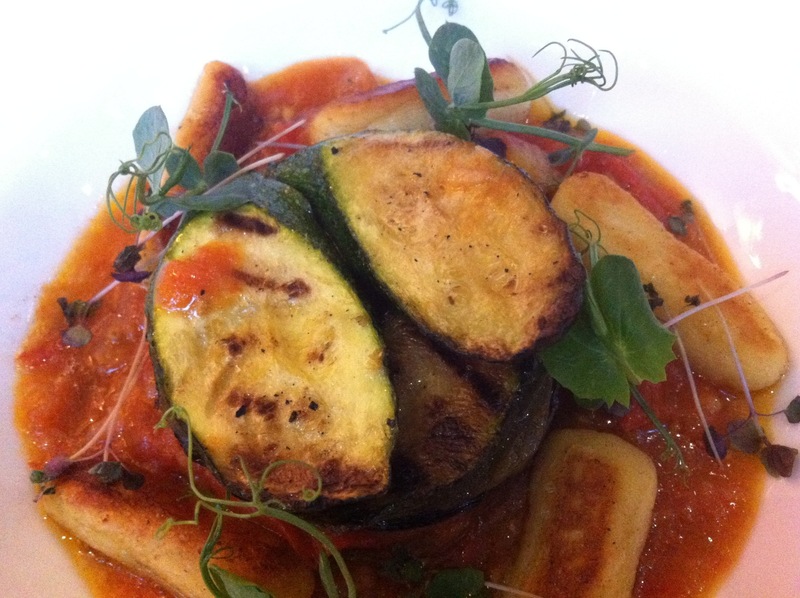 Again, a superb dish, well flavoured, with the punch of the tomato complimenting the soft potato gnocchi , and well flavoured seasonal vegetables that were delicately grilled and gave the dish it’s balance. The accuracy of cooking shown and the balance of flavours are the key to a simple dishes brilliance. 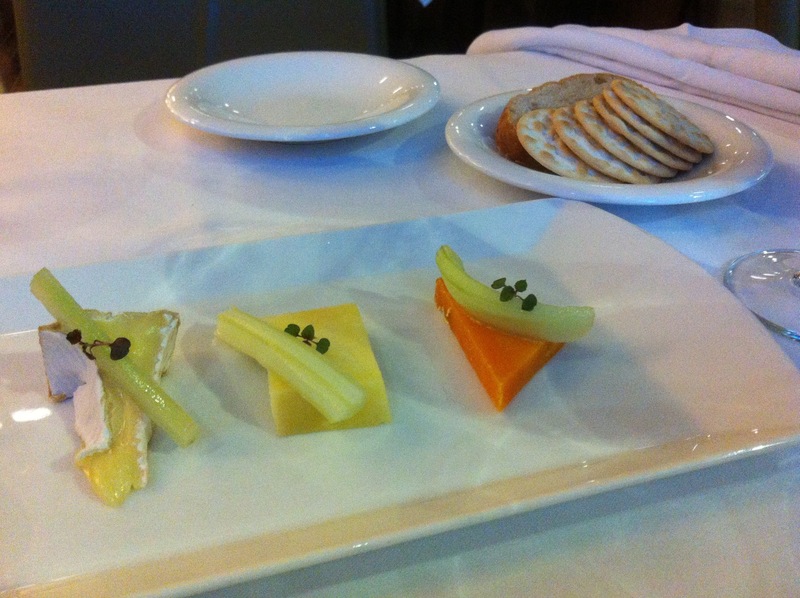 I decided to stick with the two courses, and because we haven’t ever eaten the cheese at Opus we decided to share one. This gave us three British Cheeses plus homemade fruit chutney, celery and walnut bread, which is plenty between two after a filling meal. You can order more. 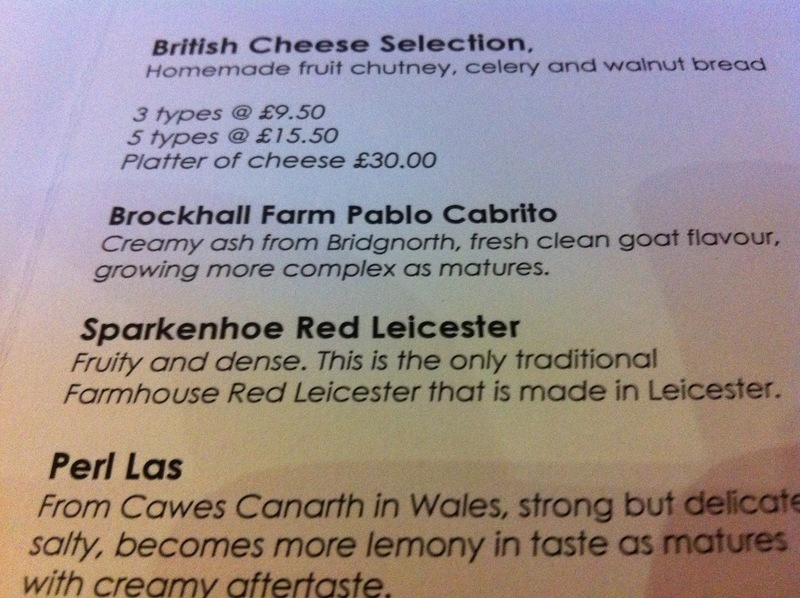 We chose the Sparkenhoe Red Leicester which is the only Red Leicester made in Leicester, a superb cheese, so much better than the norm, fresh and full of flavour. The Perl Las from Cowes Canarth in Wales. A strong but delicate cheese, salty but creamy. Lovely. 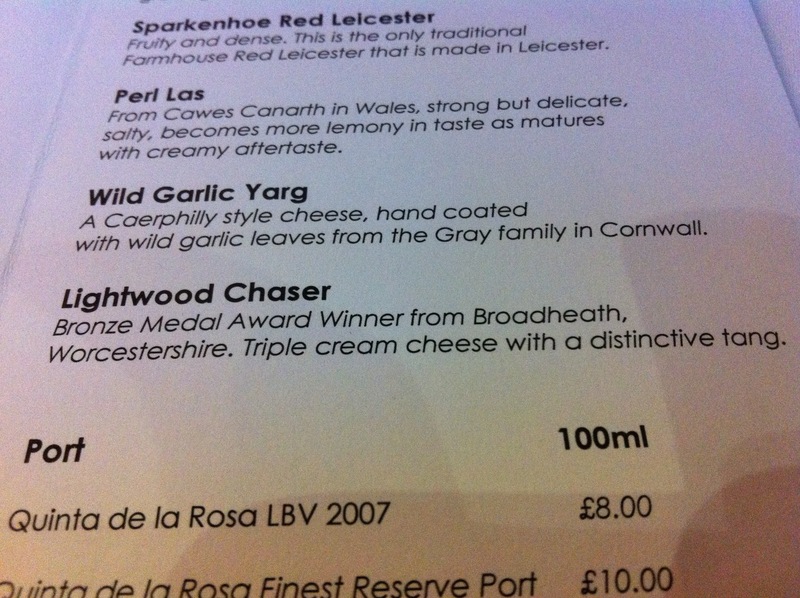 The Wild Yarg garlic, a Caerphilly style cheese, from Cornwall, again a nice flavour and the three together compliment well. 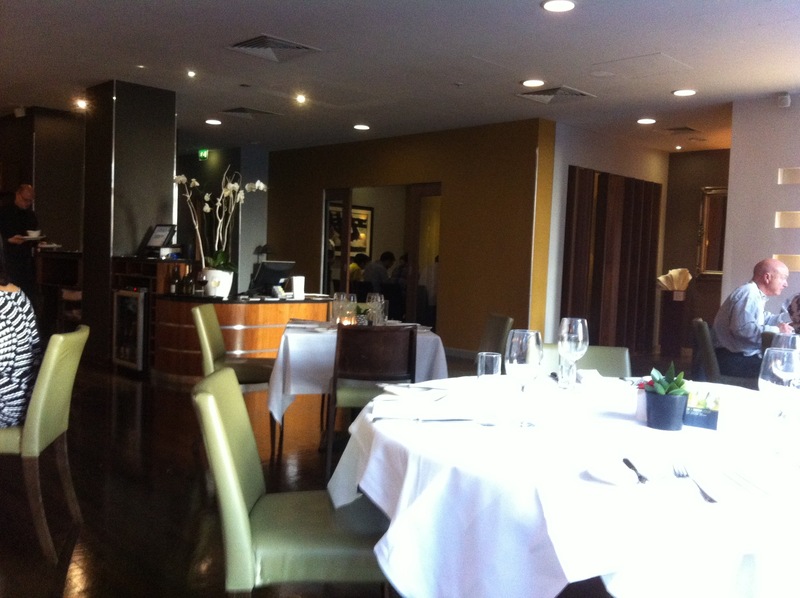 The service throughout was as refined and unfailingly good, friendly and with a touch of elegance about it. Throughout a good team, from kitchen to front of house. There is so much to like about Opus Restaurant. It’s a superb advert for all that’s good about knowing your producers, your farmers and suppliers. It’s veggie dishes are fresh, simple, but exciting, three good things on a plate. The presentation and skill is superb, the smells of the food at the table, shows the care in the ingredients and freshness of produce. My two vegetarian courses from the market menu were outstanding and I’m sure the non veggie dishes will be too. The best I’ve had at Opus and I’ve been many times. As a restaurant they are fiercely committed to their core values and quality with an ethical approach to food where the best is only good enough in season. The produce brought, the dishes created. Sounds simple. It is, but so many restaurants don’t adhere to this basic principle. That commitment is to be applauded and our commitment to that should be too. The humble veg never tasted so good, so respected, indeed Opus is a vegetarians idea of heaven. 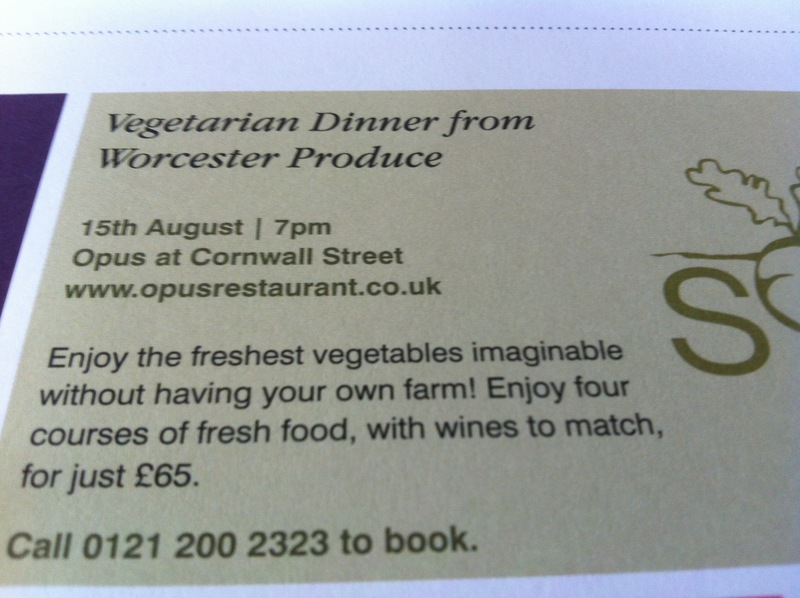 Opus restaurant will be hosting a Worcester produce source vegetarian dinner on Friday 15th August 7pm. This will be an opportunity to meet the farmers and producers from the Worcester area and eat 4 courses of vegetarian food for £45 per person with wine. Contact the restaurant on the addresses above for details. We paid for our own meal, my opinions are my own and are honest and true. We’re off to Opus tonight with my parents, your post has got my mouth watering even more! Thanks Roz, I’m a big fan of Opus and its little sister cafe opus that I recommend too especially the terrace. I think the soup I had is on the menu tonight according to their website. I also think they do on the a la Carte the Eton mess bomb that was so successful at the Colmore business district food fest two weeks ago. I didn’t realise it was on the menu until after our meal:( oh well back again:) enjoy tonight both. This sounds absolutely fantastic, I cannot wait.